Last week one of my customers brought some empty coffee jars around for me to fill with wax and turn into candles. She lives in a house which is entered via a set of outdoor stairs and was looking for a romantic way to light them up when she expects visitors.Using your old jam, coffee, pasta sauce jars, etc is a fantastic and affordable way to turn any outdoor space into a rustic and romantic area. If you don’t want to find a chandler to make the candles why not just pop a tealight into the jar. 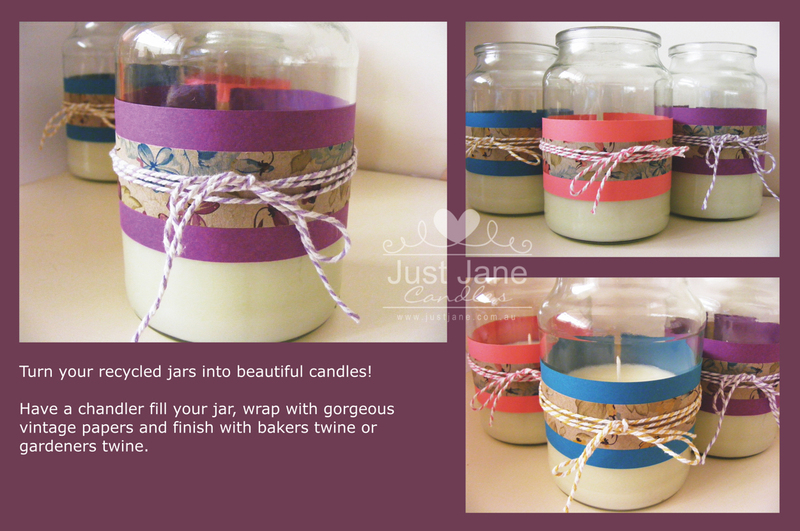 Dress up the jar with pretty papers and materials (making sure they’re well away from the flame!!) and you have a simple yet stylish candle display. You could also add wire and hang them from tree branches … the options are endless. Categories Candles, Handmade, Hints, Tips & Inspiration!